When casual movie-watchers today think of “famous books adapted into movies”, they might easily remember the more recent “book wave” that brought us “Harry Potter”, “The Hunger Games”, “Twilight” or the upcoming “Ready Player One”. About the only time a book-film from earlier decades gets this much attention is if it’s an epic like “Lord of the Rings” or a cult classic like “Do Androids Dream of Electric Sheep?” aka “Blade Runner”. Madeleine D’Engle’s 1962 “science fantasy” novel “A Wrinkle in Time” might fall in that last category, although the only film adaptation it got was a Disney TV move. Perhaps I should say “the only film adaptation thus far” prior to this big-budget cinematic feature also done by Disney. 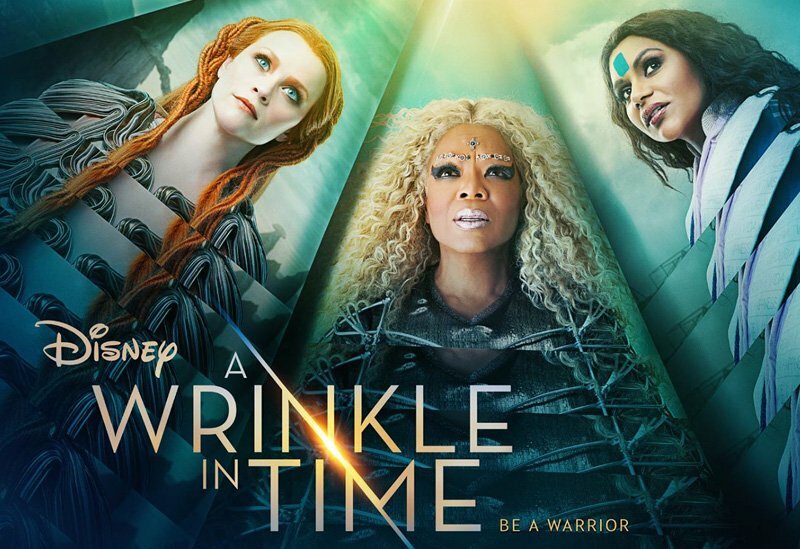 Other than the fully might of Hollywood magic behind it, this new adaptation of “A Wrinkle in Time” also has touches on topics of diversity, both in the movie and beyond the scenes. Director Ava DuVernay comes across as a blend of “Wonder Woman’s” Patty Jenkins (a woman) and “Black Panther’s” Ryan Coogler (person of color) to become the first African-American woman on the helm of a motion picture production with over a $100 million budget. And it is awesome. The movie sticks close enough to the plot of the original book, concerning two siblings and a schoolmate going on an instantaneous trans-dimensional journey across the universe to find their father, guided by three astral guides disguised as some unusual neighbors. Meg Murry, her little brother Charles Wallace and their friend Calvin run the gamut of exploring spectacular alien worlds to running for their lives from a death planet of sorts where reality alters at a whim to enforce cold conformity. Still, DuVernay manages to tweak the narrative by shifting it to contemporary times, trimming plot and adding that diversity. From the very start when we see the gloriously geeky Murry Family with NASA scientist (and mixed-race) parents Drs. Alex (Chris Pine) and Kate (Gugu Mbatha-Raw) Murry, who dearly love their math whiz kid daughter Meg (played to effective perfection by Storm Reid) and their super-intelligent adopted son Charles Wallace (Deric McCabe), even as they work on research of instantaneous travel through space, a process they call the “tesseract” or “tessering”. When Dr. Alex Murry disappears one day during his study, the family falls on hard times socially, with Meg and Charles Wallace being ostracized at school for their smarts. Things come to a head when Charles Wallace befriends some cookie ladies living next door in abandoned homes: the quirky Mrs. Whatsit (Reese Witherspoon) and Mrs. Who (Minda Kaling) who speaks mostly by quoting lines from historical and pop-culture figures. And then Calvin O’Keefe (Levi Miller), the school’s top jock, drops in on the Murry’s neighborhood out of interest in Meg (who earlier had beaned her foremost bully with a dodge-ball in PE class). With the players assembled, Whatsit’s and Who’s “leader” Mrs. Which (Oprah Winfrey) appears to explain their circumstances to the Murry siblings, and the grand adventure begins. Mrs. Which informs Meg and George Wallace that a call for help has reached Earth from their father Alex, and to find him they must retrace his journey of tessering across the universe. Here perhaps is another of the greatest draws to “A Wrinkle in Time”: the superb visual effects that are used to illustrate the instant travel used in the setting, as well as the lush alien environments that the characters find themselves during their search for the Murry patriacrch. Said trek stops briefly at the abode of a universal seer named the Happy Medium (Zach Galifianakis) for divination. Here the children learn that Dr. Murry is held prisoner in the planet Camazotz, where everything is held under the omnipotent control of the IT, an entity of darkness that opposes the light of the universe and is the enabler of the evils that all thinking beings in the universe do, like Meg’s bullies in school or Calvin’s abusive father. Despite the three Misses’ insistence that they return to Earth and regroup, Meg’s determination to find her dad takes her, George Wallace and Calvin to Camazotz, where they must now struggle against the darkness within everyone’s hearts or be doomed. Those who have read the book would realize that DuVernay has trimmed the narrative to make the story fit an under two hours of runtime. 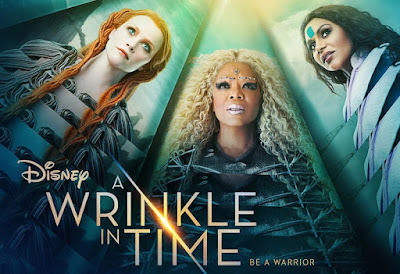 But those who saw the trailers for “A Wrinkle in Time” might be annoyed to see that a key scene previewed was not in the theater cut, which would have explained more of the movie’s lore. That was an unfortunate hiccup, but does not completely ruin the film’s fun factor, or the sublime acting of its cast, especially Reid. There’s more than enough coherence in the narrative to capture the audience all the way through. Madeleine D’Engle actually wrote “A Wrinkle in Time” as the first of a series of books chronicling a wide series of adventures by Meg Murry and her companions across the many worlds in existences by means of tessering. There has been no word yet if these further books will be adapted in turn, but as it is, this one movie stands up well on its own if it will remain a solo tale about the power of love, both for family, the people around you, and especially your own self. It’s a step up from that old Disney TV movie.